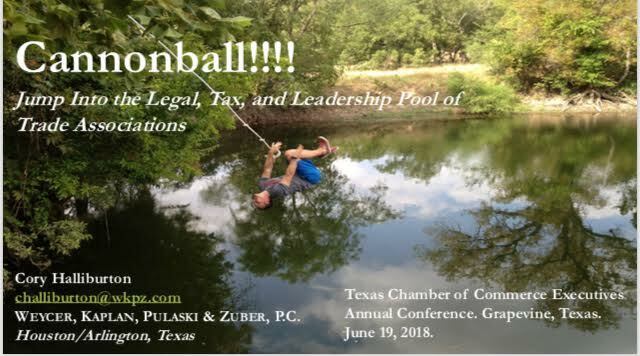 Cory Halliburton Presented At The Annual Conference Of The Texas Chamber Of Commerce Executives - Weycer, Kaplan, Pulaski & Zuber, P.C. Blog Post - Weycer, Kaplan, Pulaski & Zuber, P.C. WKPZ attorney, Cory Halliburton presented at the Annual Conference of the Texas Chamber of Commerce Executives. The presentation focused on legal, tax, and business leadership strategies for trade associations and their public charity arms. Hosted in Grapevine, Texas, the 2018 TCCE Conference was heavily-attended by Chamber executives and leaders from across Texas.